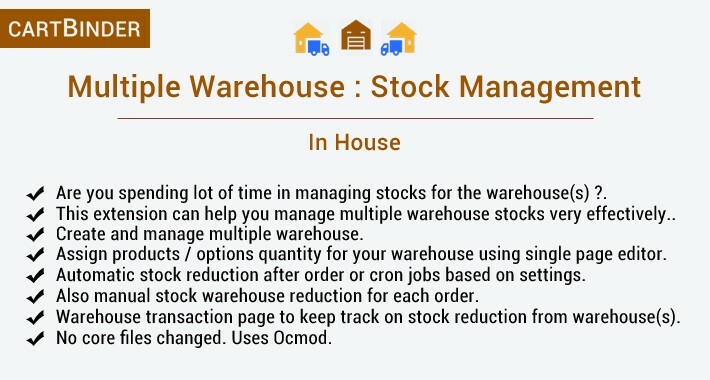 Multiple Warehouse Stock Management is an opencart extension designed for managing products/options stocks in different warehouses. It provides facility to store manager(s) to effectively manage stock in different warehouses. The facility includes multiple warehouse management, product and option level stock management, track warehouse transactions, quick warehouse stock assignment, automatic stock reduction on order, etc. - On admin link above you will find 4 different pages with help guide on each page. c) Single page product/option warehouse assignment. a) Go to catalog - product - edit - data tab - Quantity - Assign warehouse qty. b) Go to catalog - product - edit - option tab - Quantity - Warehouse qty. c) Go to sales - order list page - warehouse icon in action column. d) Go to sales - order - order info page - warehouse icon in the top right. Go to checkout. Register or do the guest checkout. Once the order is placed, warehouse stock can be checked on admin side from order list page. The stock would be auto deducted. - Add single or multiple warehouse locations as per your need. - Add sort order and zone for each warehouse which helps in stock auto deduction. - Warehouse transaction page to check each stock transaction for different warehouses. - Filters to easily find any warehouse stock transaction. - Direct order link from warehouse transaction page. - Product - option warehouse stock assignment page. - Single page editor to quickly view/assign warehouse stock. - Warehouse stocks management works until option level. - Warehouse stock deduction shown on order invoice admin side. - Reset button to reset warehouse stock value to zero. - Sum plus save button to save warehouse stock along with main quantity. - Only save button to just save warehouse stock. - Filters to easily find any product for quick edit/view. - Option to edit/view warehouse stock for each product from product form page. - Warehouse settings page to manage automatic stock reduction with different settings. - Option to manual add warehouse stock per order form order list/info page. - Cron job options available to run automatic stock deduction based on time intervals. - Added option to print warehouse details in the invoice. - This feature can be enabled from the module settings. - Works for options also. We have added multiple controls to make sure warehouse stock management is handled very effectively and easily by the admin. Kindly check them below. You can add multiple warehouses to control stock of your products. Separate page to manage warehouses. Add Name, state name, sort order based on your need. Which helps in automatic reduction of stock. Helps you to track each transaction of the warehouses. Gives you history for each transaction done per order. You can check the transaction done per product per option per order. Using filters, easily find out the necessary transaction. We have both options available to assign product and option stock to the warehouse. Using single page editor for product warehouse assignment, you can assign the stocks quickly. It is also possible to assign stocks to each product option from this page. Using 7 different filters, easily find out the necessary product/option. Manual edit option is available on each product edit form page. If you want to reduce the stock as soon as the order is placed. Suppose you have 2 warehouses. And you want to reduce stock from the second warehouse if it is not available in the first one. Keep this option disabled. If you want to reduce from the first warehouse only keep this enabled. It provides you control for auto reduction based on order status. You may want that only when the order is shipped that time stock should reduce. So you can just mark "Shipped" in order status column. You can choose the preference to automatically reduce stock. The preferences are sort order or state-based. So it would choose automatically based on your preference. If you don't want to instantly reduce stock after order placement. Cron jobs can help you. So at that time stock would be reduced form warehouse. If you don't want an automatic stock reduction, the manual method can help you. It can be done from 2 pages: Order info and order list page. Warehouse button is added to both pages. Click on it to manually check and reduce it. The help guide is available on each module pages. We offer more customization for this extension based on requirement. Kindly contact us at support@cartbinder.com before purchase. With the extension, you will get all points said above. Great extension***** fantastic support! Before we could not track our inventory accurately, now we have full control. We have 4 shop fronts and a warehouse and keeping track of stock was impossible. We had been considering an expensive inventory management system til now.